﻿ The Nectars emerge from the depths of New York’s underground music scene with a sound that echoes the punk / pop scene of the ’70s with a modern indie twist, drawing influences from a range of artists from Blondie, Patti Smith, The Ramones and The Strokes, resulting in a sound that falls between Paramore and ’90s classic No Doubt. The band are formed of vocalist Jessica Kenny, Mike Montalbano (drums / vocals), Jon Paul (bass) and Michael Baron (guitar), and despite growing recognition and interest by various labels, the band opt for a DIY approach, giving them the freedom to record whatever they want, how they want and when they want (how punk rock of them!) The Nectars debut album Sci-Fi Television tells the stories of the band in their twenties whilst paying tribute to the wide range of influences and genres whilst creating their own distinct sound with each of the nine tracks offering a fresh approach to the punk / pop scene. Opening with the energetic blast of Holy and Heaven, Jessica Kenny’s raw vocals resemble a combination of Paramore’s Hayley Williams and former Flyleaf member Lacey Sturm in perfect harmony with punk-fuelled guitars and trashy beats. However, it is in Cemetary Girl where Kenny displays her Blondie influences, following the basic structure and catchy chorus seen in some of Debbie Harry’s classics. It is clear from the first three tracks that The Nectars have plenty to offer, showing their ability to infuse classic punk / pop techniques with new life. We Will Run breathes so much young energy with the idea of chasing adolescent dreams and leaving everything behind becoming an instant favourite with young listeners with its contagious lyrics “We are Sci-Fi Television love” making it an instant ear pleaser. It doesn’t stop there, I want it and Tame introduce a seductive transformation of empowerment with a female lead belting out notes, demanding to be heard with the lyrics “I want it now, so give it to me now” above the crunchy guitar tones. While the content may be controversial, it definitely gives the message that The Nectars are far from afraid to explore areas that others fear to, toying with power dynamics and jarring chauvinistic ideals. Alternatively, Don’t Panic allows the talented Michael Baron to show off his skills with running guitar solos with a beating bass drum before Jessica’s distinctive vocals announce “Ladies and gentlemen, may I have your attention please, first of all don’t panic, but the building is on fire”. The album ends with the snappy Tired which turns up the punk dial starting off with bassist Jon Paul’s vocals reminiscing on their youth and not allowing peer judgement to ruin the experience. The band’s creativity and their expression of rebellion against the conventional is what makes Sci-Fi Television a truly refreshing listen. With such a diverse debut album, The Nectars are definitely one to look out for in the future. 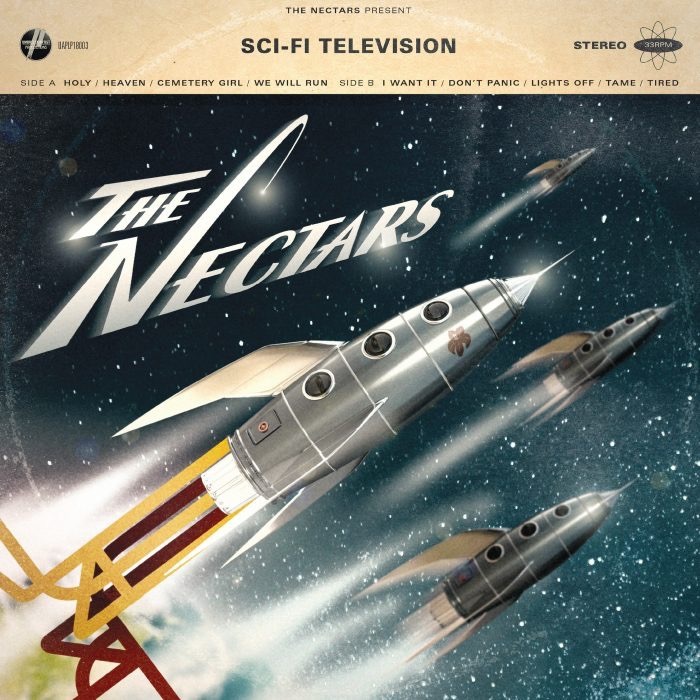 ‘Sci-Fi Television’ by The Nectars is out now.